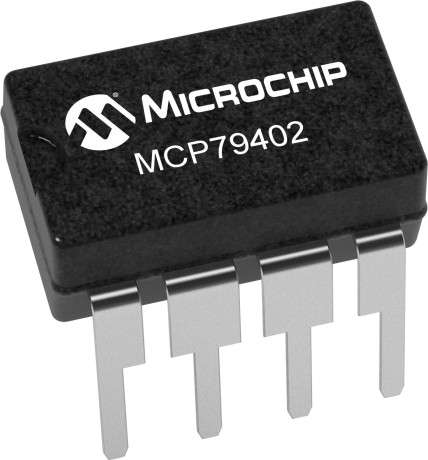 The MCP79402 general purpose I2CTM Compatible real-time clock/calendar (RTCC) is highly integrated with memory and advanced features normally found in higher priced devices. These features include a battery switchover circuit for backup power, a timestamp to log power failures and digital trimming for accuracy. Using a low-cost 32,768 kHz crystal or other clock source, time is tracked in either a 12-hour or 24-hour format with an AM/PM indicator and timing to the second, minute, hour, day of the week, day, month and year. As an interrupt or wakeup signal, a multifunction open drain output can be programmed as an Alarm Out or as a Clock Out that supports 4 selectable frequencies. In addition to the SRAM memory, there a unique ID that is factory programmed in a locked section of EEPROM with a MAC Address. This ID can also be unlocked and reprogrammed by the end user. General purpose RTCC with features that target low power and smart energy applications.